This page has moved to the Discounts and Promo Codes tab. FYI, the MPIX code is showing 10% when I try to use it. Thanks for the report Brisa! I am looking into this right now because I wast told it would be a 15% discount. There's apparently a disconnect somewhere so I'm working to resolve it. Ok cool. Let us know if you figure it out. I may have to hit them up for a slight refund. MPix.com just confirmed that it seems to be working now, and I confirmed it works using my account. Email john@mpix.com or me if you have any troubles. Hi I have just bought Viveza2 upgrade (great product). However I could not find a place to put your discount code RMARTINSEN during my purchase so I have paid the full 99.95 Euro. £92.51. I have written to Nik support to see what their comments are and will let you know if I receive any comment. 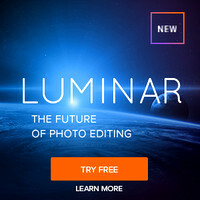 I recently purchased Nik Software’s Complete Package for Photoshop. When I loaded it only Viveza appeared in the menu system. Technical support at Nik said that the “problem” was that I was running the 64 bit version of Photoshop. I found nothing in their literature that says that Sharpener Pro, Define, Color Effects, etc. don’t run under 64 bit Photoshop. Has anyone else run into this problem? Is there a workaround? Most Photoshop plug-ins (by many companies) are just starting to make 64-bit versions of their plug-ins available, so this is quite common. This is one of the reason why Photoshop automatically installs both the 32-bit and 64-bit versions, so you can run the 32-bit version of Photoshop and get all of your 32-bit versions to work. I'm glad to see Nik finally supporting 64-bit for Viveza, and expect that others will be ported to 64-bit in the future. Companies like Imagenoimc, onOne, etc... are also rolling out 64-bit versions now as well. This is a transition period for companies to embrace the 64-bit world, so it's a little slow to happen. To my knowledge, this is happening faster on Windows as I'm not aware of any 64-bit offerings on the Apple platform - yet. I use the 32-bit version of Photoshop when applying plug-in effects, and when i'm done with that work if memory is getting low i'll move to 64-bit for the final touches. It's a hassle, I know, but it's one that hopefully will sort itself out over the next year as more companies embrace the 64-bit platform. In any case, you saved me 10% and I wanted to take to thank you for keeping those coupon codes current. The internet is just like the world. You never know when we will all meet up again. In the meantime, YOU ROCK! Sadly, your Nik Software discount is not available in Europe. Nik claim it is only available to US customers, but it is available to e.g. South American, Chinese, Australian, and NZ residents via the Nik Software International (US) site. Unfortunately, Europeans can't use that 'internation' site because there is no way to enter a European country on the site's billing page. I've sent mail to Nik Software about International deals, and they are trying to work something out. In the meantime, thanks for supporting the blog. Is there any discount coupon codes for B&H? B&H doesn't provide coupon codes usually so I don't offer any at this time. Their prices are pretty competitive, and unlike a few sites who might be slightly lower - you are assured to get good customer service even on returns. Don't be penny-wise, and pound foolish - shop at well respected retailers like B&H and Adorama. If you like this blog, then do me a favor and show your support by using the links or search box here! 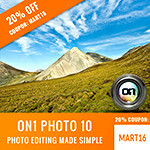 looking for mpix.com coupon codes... asap! any help? thanx! Please contact the marketing department at MPix.com and tell him you want ronnmartblog.com to have coupons again. My blog was so successful with the coupon codes that they stopped assigning codes to me. The code for kelly moore bags is not working anymore. Is it possible to have it back ? SandrineB - yes, I appreciate the report and I'm working with Kelly Moore now to resolve the problem. Thanks for your patience as I hope to have this resolved soon! The Kelly Moore code is still working, but it won't work if you have extra spaces. If you try to copy and paste you'll get an extra space which is probably why it failed for you. Works for me. 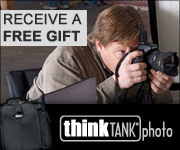 Click on the banner here at http://www.ronmartblog.com/2010/01/learn-more-about-think-tank-photo.html and add your item to your cart. These Discount coupon codes save my money. Thanks for sharing. Great job. Through the link on Foto Quotes site I read your review and find..."Hey look, a 10% coupon code". I assume that is history in the news but nowhere to br found.